Time flies too fast - next week is the last week of senior year, followed by finals, provincials, commencement and prom. Even with all this stuff compiled I'm still procrastinating in the posts (oops)...but I'll try my best to update as much as possible before summer. There are just so many things to make with so little time! Traditionally, linzer cookies are made with ground almonds to give its nutty aroma and pale colour. However I found some toasted hazelnuts left around in the house, so I "recycled" them for good use. We all know how aromatic these nuts can get (Hazelnut latte from Starbucks anyone?). These nuts proved their "talent" as soon as you take the first bite - like Nutella but the more nutty kind. 1. Grind the toasted hazelnuts to flour-like texture in food processor. 2. Cream butter, sugar, vanilla until light and fluffy. 3. Whisk together hazelnut flour, all-purpose flower, baking powder, and salt. Add to butter mixture and mix until just incorporated. Add some water if the dough is too dry (which I did). 4. Place dough on a sheet of cling film and wrap into a disk. Refrigerate for 2 hours or overnight. 5. Roll the dough out on a floured surface to about 5mm thickness (very important for thinner cookies...I learned it the hard way since I didn't...). 6. With your favourite cookie cutters, cut out the cookies and cookie holes. Place the cookies on cookie sheets and bake at 350 F for 15 minutes or until edges are golden. 7. 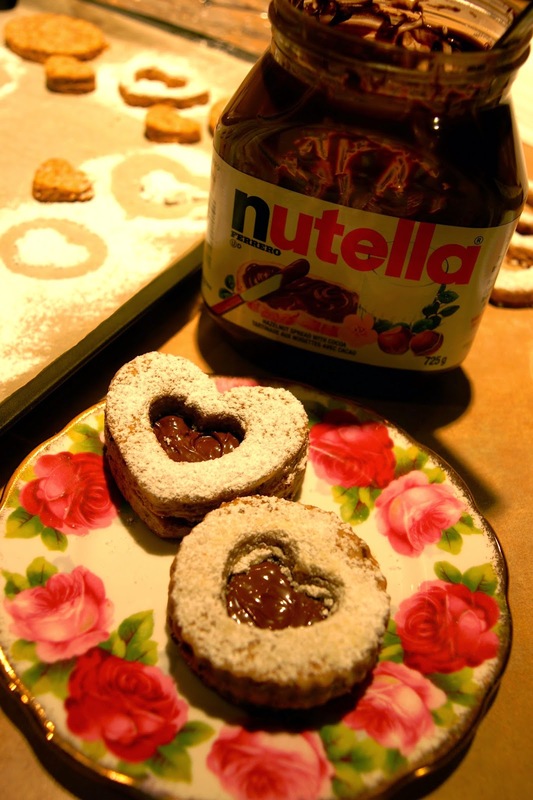 Spread nutella on the bottom half of the cookies, then stack the top piece on. Dust with icing sugar.